Picus pulverulentus Temminck, 1826, Java and Sumatra. Two subspecies. French: Pic meunier; German: Puderspecht; Spanish: Pico Pizarro. 19-20 in (48-50 cm); 12.7-20 oz (360-563 g). The largest Old World woodpecker; "lanky" in appearance; male is gray on top of the head and hind neck, with a slight crest, a pale red "moustache," yellow-white throat with red-tipped feathers, and the rest of the body dark gray, darkest on the wings and tail; female is similar, but lacks the red; immature is dark gray tinged with brown. Northern India to southwest China, Southeast Asia to Sumatra, Java, Borneo, and Philippines. M. p. pulverulentus, Malaya-sia, Sumatra, Riouw Archipelago, Java, Borneo, North Natuna Islands, east to Palawan; M. p. harterti, India, Nepal, east to southwestern China and Indochina. Extensive forested areas, including second growth, up to about 1,000 feet (300 m). Nonmigratory; often seen in pairs or small (family?) groups; voice described as "almost honking" to a distinctive whinny; flight is less undulating than smaller woodpeckers. Displays include head-swinging with both wings and tail extended; drums loudly. Forages mostly in tall trees, where it excavates larvae of wood-boring beetles and other arthropods, but also feeds on ants on the ground and occasionally hawks flying ants and other insects. Nests from March through August; both sexes excavate nest cavity, but male dominates; nest is generally high (27-135 ft; 8.2-41 m), dug into very large stubs or branches. Clutch includes 2-4 eggs; no data on incubation period or age at fledging; both sexes incubate and care for young; young may remain with parents until next nesting season. 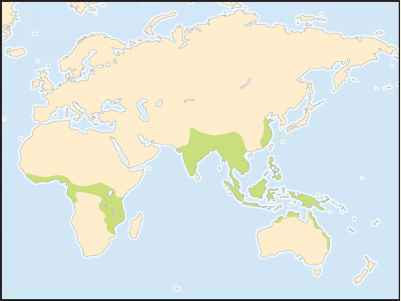 Not threatened, but uncommon to rare (e.g., Java and Sumatra), and threatened locally by deforestation.